Cy, one of the Morehouse Rams. Being a father is an important job, which is why it doesn’t go to just any ram. We’re looking for one that has a great fleece – superfine, super soft, bright white and clean, with consistent crimp the whole way through. We’re looking for one that has good confirmation, which means that he has straight and strong feet, legs, and topline, and of course good teeth. All of these traits are very important because they’ll be passed down to his offspring. 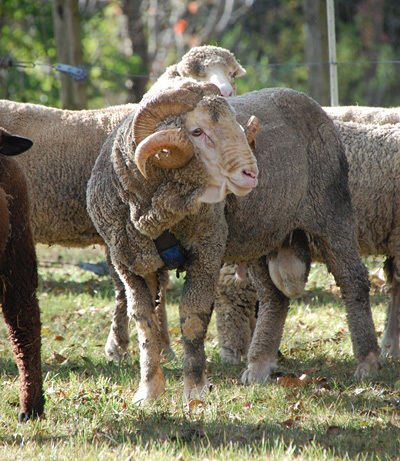 Merinos are one of the few breeds of sheep that have dual estrous, meaning they can breed in the fall or the spring. Lambs are born after 5 months of gestation, and twins are the most common. The blue patch on his chest is a marking crayon. It’s part of the harness the ram wears while he’s in with the ewes, and is a tool shepherds have come to rely on for the simplest and most accurate forecast of when to expect the first lambs. When the ram breeds the ewe, he’ll leave a nice patch of color behind, showing exactly what he’s been up to! Good shepherds count the marks and note which ewes are sporting them, and mark the calendar for 145 days out. If you’re counting, look for lamb news come late-March! Know someone expecting a new little one themselves? Check out these fabulous knits for baby.